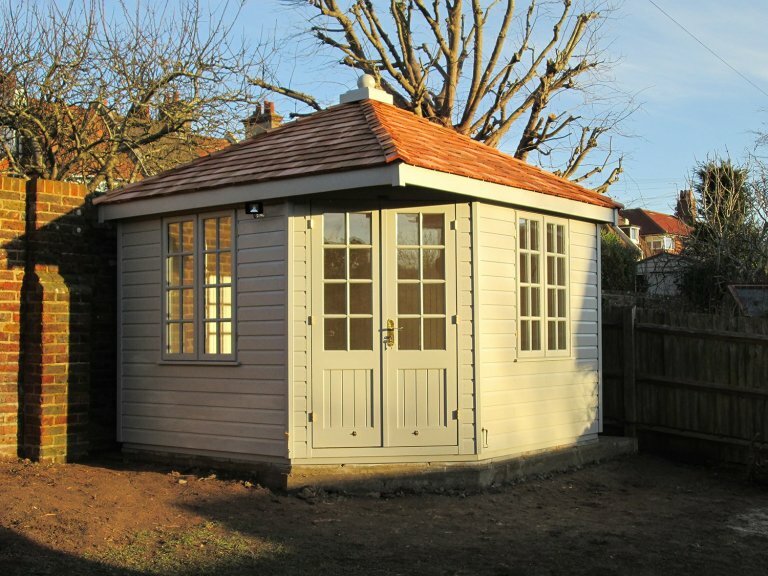 This quaint corner Summerhouse was recently installed for a customer based in Pevensey Bay, East Sussex. 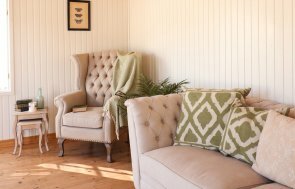 The building was designed and hand-crafted at our factory in Norfolk before being both delivered and assembled at the customer’s specified delivery address by our in-house installations team. This particular design of building is available in our range of Summerhouses and is ideal for those seeking to maximise garden space or those that have a corner plot. 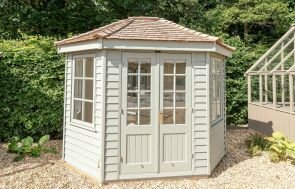 Our Weybourne Summerhouse has an attractive hipped roof topped with a traditional finial and boasting an overhang above the double entrance doors. All windows in the building are of a stunning Georgian style and open to allow for ventilation and an abundance of natural light. The exterior is clad with smooth shiplap cladding, which the customer chose over the alternative option of rustic weatherboard timber, this is painted in the opaque exterior shade of Pebble which was selected by the customer from our vast range of paint options. The hipped roof is covered with cedar shingles, an attractive choice that merges beautifully within natural surroundings and will silver as part of the natural ageing process. Internally, the summerhouse is fully insulated and lined with Ivory painted pine lining, this allows the customer to begin immediate use and enjoyment subsequent to installation, without the hassle of painting the interior or worrying about limited use during the colder months. For those wanting to take their summerhouse a step further and enjoy electricity and heating within their building, this is possible with our electrical pack that can be added onto most buildings across our range. In order to find out more, we recommend that you pay us a visit at your nearest show centre, where there are up to 25 different display buildings and a team of friendly advisors on hand to assist you. Locate your nearest here, or alternatively, get in touch with us on 01760 444229.